Many perceive the difference in terms of size, “university” means big and “college” means small. However, there are 467 institutions with “university” in their name that have 3,000 or less undergraduates with 109 having less than 1,000. There are some pretty big colleges out there as well. A total of 79 have 5,000 or more students, 163 have 3,000 or more. Do Graduate Students Make it a University? A more traditional definition is that universities have graduate students where as colleges do not. Of the 983 institutions calling themselves “university,” 86 have no graduate students with 178 having five percent or less of their students classified as graduate students. As for the 552 schools with “college” in their names, only 243 have no graduate students while 211 have five percent or more graduate students. The closest thing to an “official” definition is the Carnegie Classifications but even it is vague on the differences between a university and college. It has three types of Baccalaureate Colleges where 205 have “university” in their name. 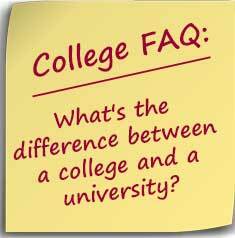 There are also three categories of university and there are only six schools that fall into that category and have “college” in their names. As far as the differences between “colleges” and “universities,” there really aren’t any. Or rather, there aren’t any that are well-defined enough to actually use in your college search.